A new video released by MissionX hints at what participants can expect in a 5-day Special Operations Adventure Experience held in Amman, Jordan. In conjunction with the first adventure, participants will enjoy a complementary 2-day stay at the Moevenpick 5-star resort and a guided tour of the ancient city of Petra. MissionX’s new video gives viewers a glimpse of the extreme and realistic special operations environment created for the adventures. AMMAN, Jordan, January 29, 2013 [PRWEB] – MissionX’s new video gives viewers a glimpse of the extreme and realistic special operations environment created for the adventures. Taking advantage of a unique relationship with KASOTC, the King Abdullah II Special Operations Training Center located in Amman, Jordan, MissionX gives vacationers the chance to spend 5 days and nights engaging on covert missions with a team of international former Special Forces soldiers. The short video is filled with the sounds and imagery that befit the adrenaline spiked experience envisioned. The real commandos referred to are Special Forces soldiers from elite units in the United States, Great Britain, New Zealand and Denmark. They have all proven themselves in the field and in addition to their military expertise; they are accomplished authors, world-record holders in extreme sport, world-class athletes, leadership coaches, stuntmen and shooting champions. The first tactical adventure at KASOTC is scheduled for February 16 through 20. 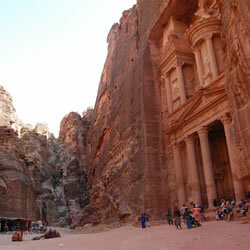 Participants on the inaugural adventure will also receive a complementary 2-day stay at the 5-star Moevenpick Resort Petra. Guided by a local, entry to the ancient city of Petra, one of the Seven Wonders of the World, famous for its rock-cut architecture and water conduit system is included. Participation in the first MissionX adventure will be marked by a high quality limited edition plaque and certificate of completion signifying participation in a special operations adventure experience. MissionX provides tactical adventures, leadership and development training and consulting to the film first and television industry. Details of military tactics that could put real military personnel at risk are not revealed. Tactical adventures involve highly-charged, realistic war-game scenarios. Leadership and development training is structured around military situations and operations. Technical advising for film and television draws on the expertise of an international team of ex-special forces operators with real-life experience of film making and special operations. For more information go to http://www.missionx.com.